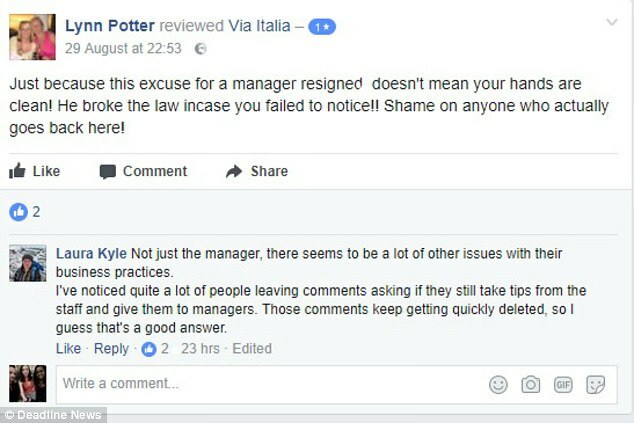 A "BULLY" restaurant boss quit after a distraught waitress claimed on Facebook that he called his staff "idiots" - sparking a wave of one-star reviews. 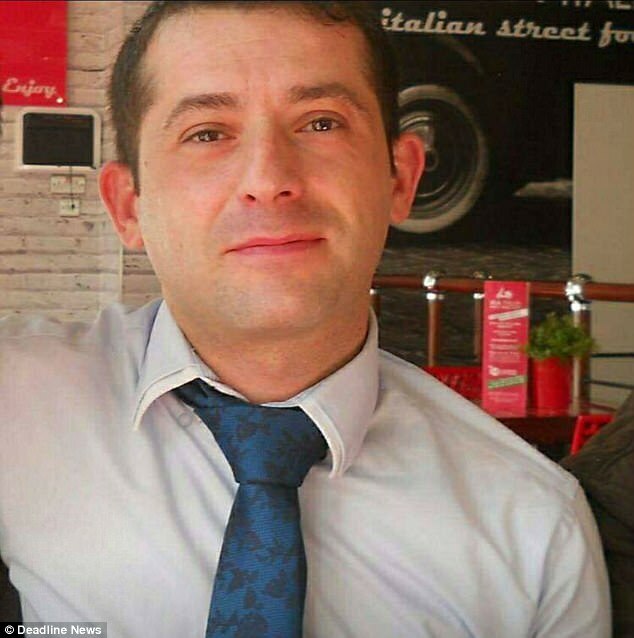 Michelle Woods was on a trial shift at Via Italia in Glasgow when Guiliano Delia allegedly intimidated female staff to the point of tears in front of customers. 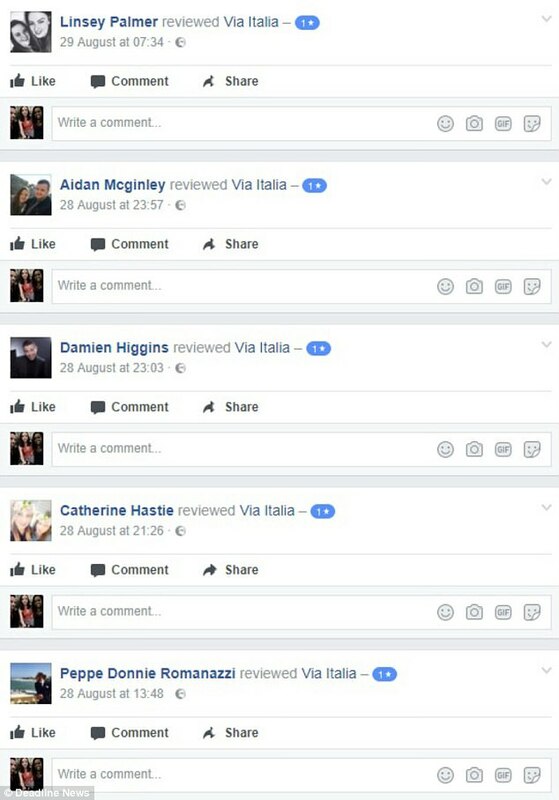 Her claims prompted more than 40 angry customers to leave one-star reviews on the Italian restaurant's Facebook page. Just a few days later, the owners revealed Mr Delia had stepped down. Michelle worked her trial shift last Saturday and posted her allegations on her Facebook page the following day. 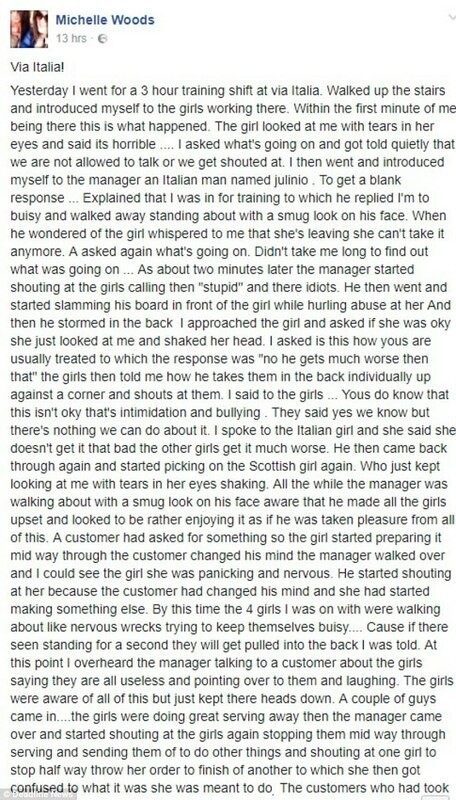 She claimed: "It didn't take me long to find out what was going on...the manager started shouting at the girls calling them 'stupid' and 'idiots'. "He then went and started slamming his board in front of the girl while hurling abuse at her. Then he stormed in to the back. "I approached the girl and asked if she was okay she just looked at me and shaked her head [sic]. "I asked is this how yous are usually treated to which the response was, 'No, he gets much worse than that'." She continued: “By this point the girls were all nervous wrecks, every one of them looked as if they were about to break down. "I had seen more than enough by this point that I had already decided I wasn't stepping foot in that shop again. Several people were quick to jump to her defence and turned to the restaurant's social media page to leave negative reviews. Craig Taylor wrote: “Hospitality Staff tend to be underpaid at the best of times without being subjected to this horrendous behaviour at work!" Michelle Claire also left a one-star review, she claimed: "Was just reminded of the time we went in on a Saturday lunch time and he was shouting in the back, seems it wasn't a one off." Lisa Thomson said: "I worked in the industry for nearly 12 years and unfortunately, working in Italian based restaurants, some times this is the norm." The restaurant has not responded to requests for a formal statement, however, a call to the Union Street restaurant this morning asking to speak to Guiliano, was met with the response: "He is no longer with us." Michelle, whose post sparked the storm, responded: "I'm happy - that was the outcome I was wanting." Social media users were also pleased that the manager in question had resigned. Matt Walton said: "Well done them." Karen Coyle added: "From what I've read the manager resigned, good work guys." Mr Delia could not be reached for comment.